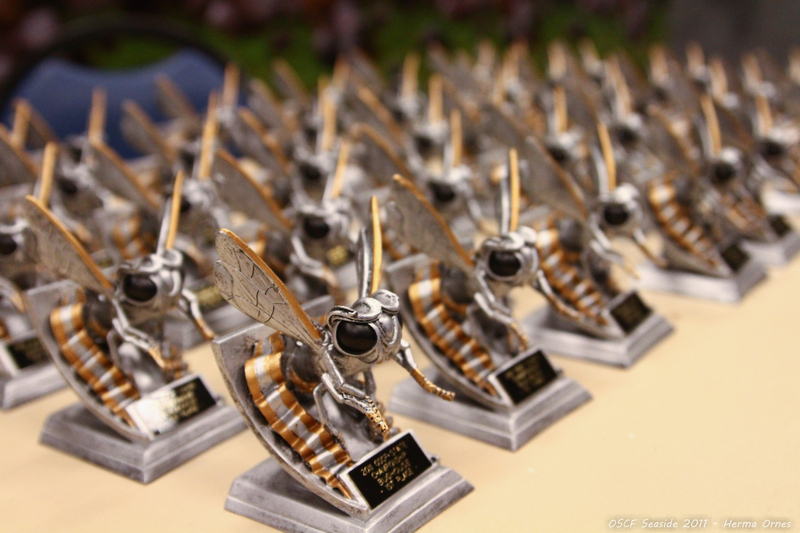 Some of the biggest buzz that comes our of the OSCF State Championship is the Bughouse Tournament on Friday night. The game itself is fast, crazy, creative, and requires an ability to see what you want the chess board to look like — not what it is. This team event is cooperative and brings a uniquely social aspect to the game. And on top of all that, we add contests for the Craziest Chess-Themed Hat and the Most Popular Bughouse Team Name. 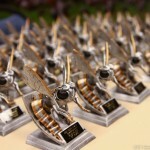 The goal is one of the unusual “bug” trophies given to the winning team in each subgroup. But even the losers don’t suffer too much — we take the sting out by making them eat worms. First, an important request: PLEASE BRING YOUR CLOCKS!! Coaches and teams with several clocks, please bring them all. 1) Before you check in: Find a partner and come up with a team name. When you check in, you will need to have a partner; we strongly prefer that both of you are there in person, though we can make exceptions if absolutely necessary. If you DON’T have a partner yet, let us know at the check-in desk. We will have a way to match you up with other partner-less bughousers, and then you can come up with a team name and check in together. When you check in, you will need a team name. Please keep team names to 32 or fewer characters, and note that you will need to let us type the name in, so the harder your name is to type, the longer it takes, and the likelier it is that we will not start on time. 2) Check in (or purchase tickets). You and your partner must check in for Bughouse no later than 6 pm on Friday. If you HAVE NOT purchased tickets already, you must check in by coming to the B-Hive in the foyer of the Convention Center to buy a ticket and confirm your purchase. Cost is $15. Give us your payment, the name of both players, and your team name, and you’re checked in. a) Team name that you and your partner have agreed on. Remember, less than 32 characters, and we need to be able to type it. b) Grade of Player 1 and NWSRS rating of Player 1. We can look up the rating if necessary, but if you have checked into the main event, the rating will be on your nametag. c) Grade of Player 2 and NWSRS rating of Player 2. Again, we can look it up if you don’t have your nametag. Note that this year you DO NOT need to check into the main event (i.e., get your nametag) before checking in for blitz or bughouse. That said, we do strongly recommend that you get your name tag once you arrive on Friday — either before or after checking into blitz / bughouse — in order to avoid the rush on Saturday morning, in the morning, but the order of doing so doesn’t matter. 2) Arrive at the Convention Center around 6:45, with play to start at 7 pm. We are trying something new this year and playing in the large (Pacific) room. We will have board numbers placed on the tables in the room; please don’t disturb them. Once pairings are ready, players will be arranged into (mostly) Quads — groups of 4 teams, eight players altogether. Those groups will usually be arranged by total rating of the team, though we do make some exceptions and generally have adults play up, or play each other. E.G. Quad A will be the highest four combined team ratings in the tournament; Quad B the second four highest, etc. If the number of teams playing is not divisible by 4, we will have a couple of groups of 5 or 6. We are working on methods for displaying the pairings so all can see. We’ll hold the crazy hat and best team name contest once everyone’s settled, and then play will begin. In each group, every team plays every other team twice — play once, then flip colors and play again. Mark down the score for each game. Each quad manages its own play. The youngest players may need assistance with this; for adults of the youngest kids, please assist as best you can. For the oddly-sized sections, the teams will usually play each other only once, but we will talk about it with those groups. Because we are going to be playing in the pacific room this year, we will need to move all the chess sets back into the Green / Necanicum room after bughouse is done. For that reason, once each group is done, we ask that the players reset the boards to be sure that you have all the pieces with the appropriate set. Then pick up both set and board and take it to the Necanicum / Green room, and set up the board in the appropriate places in that room. ONLY after that has happened can you report the outcome to the TD and receive your trophies and gummy worms. Generally speaking, we will finish about 75 minutes after we start, so we’ll be done a little after 8:00 PM. Note that there is a meeting for TDs that will take place immediately after bughouse is done.